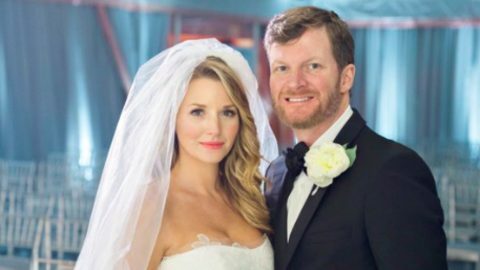 NASCAR megastar Dale Earnhardt Jr. married his longtime girlfriend Amy Reimann Saturday night (December 31). The New Years Eve wedding took place at North Carolina’s Childress Vineyeards in front of a crowd of family and friends that included many of Earnhardt’s fellow NASCAR drivers. “Happily married!!! What an amazing experience. Looking forward to the rest of our lives @Amy_Reimann. #honeymooners,” 42-year-old Earnhardt tweeted Sunday morning. 7 hours ago @dalejr and I are beginning 2017 as Mr. & Mrs.! Thank you for loving me and making me your wife. My heart is truly filled with love and joy. Fellow NASCAR drivers Kyle Busch, Danica Patrick, Denny Hamblin, and Rickey Stenhouse were among those in attendance. Patrick posted on Instagram that she caught the bouquet. Ohhhhhh, who caught the bouquet?! ?? Earnhardt and Reimann started dating in 2009 and got engaged while on vacation in Germany in June 2015. Photos of their wedding started circulating online as guests shared snapshots from the event. Amy Earnhardt took to Instagram Sunday afternoon (January 1) to share a brief video of the event giving fans a glimpse at the ceremony, first dance, cake, and stunning decor. Earnhardt was recently medically cleared to compete in the next season of NASCAR competition after missing 18 races of the 2016 because of a concussion suffered in a crash. He will return to the track driving No. 88 Nationwide Chevrolet SS for Hendrick Motorsports at the Daytona 500 on Feb. 26. Congratulations to the happy couple! Watch a video of Dale Jr. and Amy’s first dance below.